One of my bridesmaids was also fairly recently married – and what a blessing this was! There are some things you only learn once you’ve been a bride yourself – and I hope to share as many of these gems with you as I can. 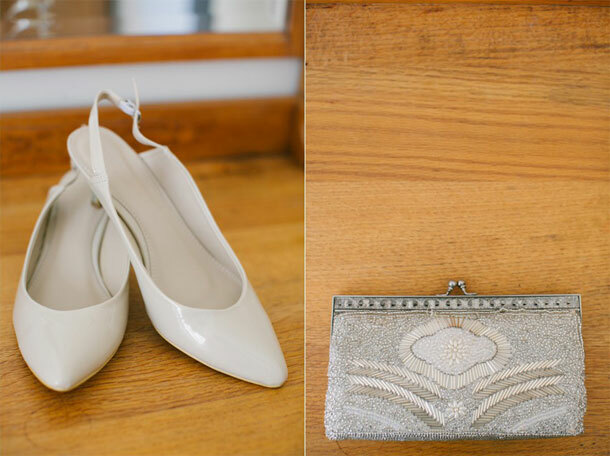 One particularly useful idea was “the bridal bag” – a little bag filled with essentials for the bride for her wedding day and night. Here are a few suggestions of what to include to make sure you’re looking and feeling your best all day. Delegate “the bag” to one of your bridesmaids to look after for you – and to have on standby should you need anything. Your lips will dry out from all the congratulations and a husband sneak-smooching you at every opportunity – take a stick of lipice, the lipstick you are wearing and a gloss. Also if you’re feeling a little spotty, some concealer to touch up, powder to stop the shine in photographs, and mascara and blusher if you feel you may need it. To smell your best throughout the day, and to make you feel fresh and lovely when you leave your reception. It will be a long day – and to help you feel your best and loveliest for your groom, pack in a spare pair of knickers. It will also allow you to wear something comfortable and practical during the day, and change into something a little more romantic before you leave your reception. To tame any stray ends, flyaways and frizz (you never know what your hair will look like during your photographs) – it’s best to be prepared. There’ll be a lot of talking and kissing happening – make sure you’re always minty fresh for that next smooch! Sounds like you may need a mary poppins bag. Perhaps the bridesmaid can hang on to some stuff. But great tips on what to make sure you have with you! I agree … I didn’t have a bag full of goodies but popped my lippie and perfume into my brothers jacket pocket. Rather conveniently I had a small tester / sample bottle of perfume which was easier than carrying around the full size version. What a cool idea! Very good advice, thanks. It sounds like a lot to fit in one tiny little clutch bag. Perhaps a mini version of everything.